MinerBumping.com: Miners Turning Against Each Other? The story of our time, the story of the New Order's liberation of all highsec, is an elegant tapestry. There are many threads in this tapestry, all woven together in beautiful fashion. Tonight I present a report forming a continuation of two threads we have already seen. Don't miss a post! Earlier this week, we learned of Neltharak Idrissil, an Agent of the New Order who has been bringing justice and enlightenment to the ore miners of Isinokka. If you didn't read that post, you can get caught up here. Neltharak Idrissil > So, what's the mining range on ahulk already ? Once the pleasantries were out of the way, Neltharak wasted no time in getting to the heart of the matter. Neltharak Idrissil > Do you know about our lord, the Savior of High sec, James 315 ? As is sometimes the case, the miner needed to be bumped to prevent a hasty end to the conversation. 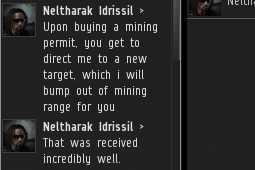 Neltharak gave the miner a brief rundown on the New Order and made the offer. Neltharak Idrissil > i bump whoever of your choosing. For reasons unknown, the miner wanted to inflict bumping on another target, something he was interested in even more than purchasing a mining permit. It is possible that highsec miners hate each other more than the rest of EVE hates them? It's certainly food for thought. 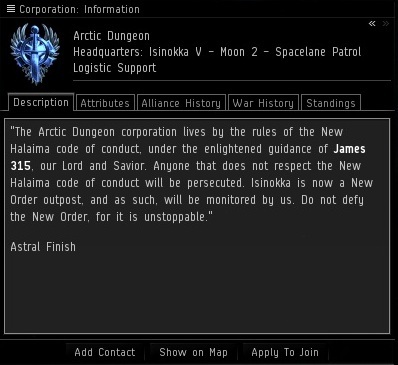 Neltharak, who hails from TEST alliance's Enlightened Industries, also created a corporation specifically for the purpose of wardeccing those who defy the New Order. In the previous post about Isinokka, we took a look at the geography of northern Lonetrek. 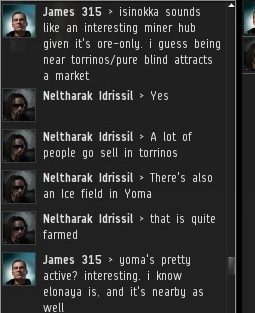 I didn't pass up the opportunity to ask Neltharak for additional intel on that area. This will be useful to us, since we plan to bring all highsec systems under our protection--and northern Lonetrek probably sooner than most. The advantage of being on the side of progress: We're always on the march. I wonder if a new branch of mercenaries will develop following these events.